A bit of fresh sweet salad mix, kangkong (Asian water spinach – a cooking green), garlic chives, and fresh mint. From our partners: Solitude Farms dragonfruit, Haitian kidney mangoes from Tropical Exotics orchard, and vegan coconut ice cream from I-Sha. 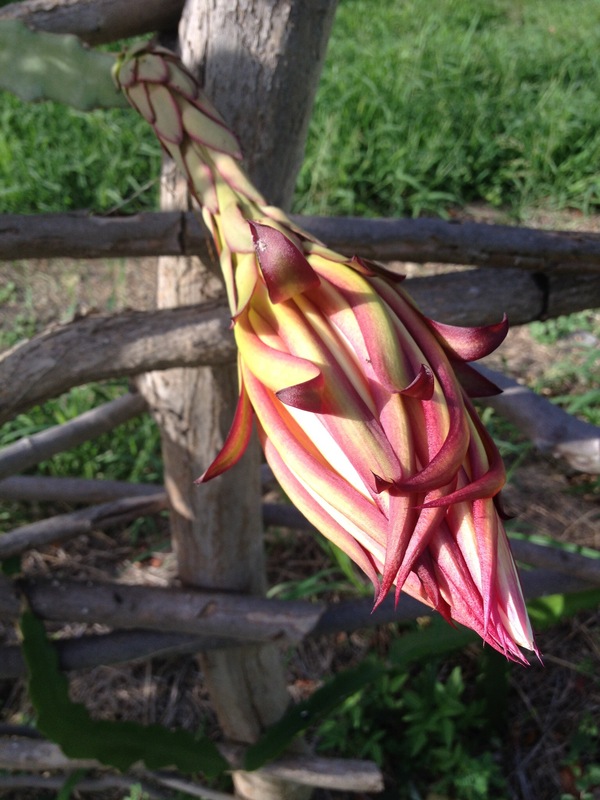 Zamorano (Hylocereus polyrhizus) has one of the flashiest dragonfruit flowers. Luca pollinated two of these flowers tonight. If all goes well each flower will produce a ripe fruit in approximately 3-4 weeks. We will not have salad mix next week, nor for the next several weeks. We will still have some dragonfruit and mangoes, if you would like to purchase those over the next couple of weeks feel free to call the farm and we’ll do our best to accommodate you off-hours.